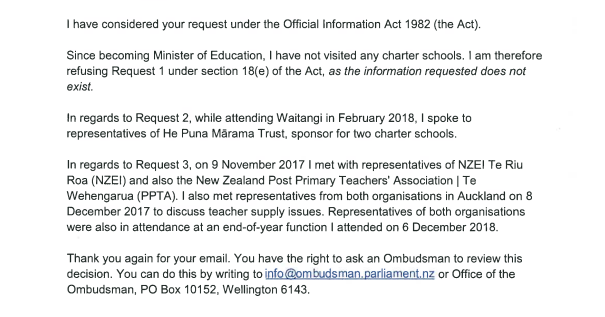 Perhaps unsurprising, but definitely disappointing, is that Education Minister Chris Hipkins has made plenty of time in his ministerial diary to meet with education unions, but virtually none to meet with, or visit, Charter Schools. The exception to this being when Hipkins spoke at Waitangi with representatives of He Puna Mārana Trust, the sponsor of two Charter Schools whose connections to Te Tai Tokerau MP Kelvin Davis have been the subject of Parliamentary scrutiny. But it also makes sense for the Minister to at least have made an effort to engage with Charter Schools too other than his edict that they either submit (in good faith of course) to the Ministry of Education gutting what's made them so successful, or he'll use his powers as Minister to tear up their contracts. These schools are benefiting 1,000 students, some of them amongst New Zealand's most vulnerable kids, and are turning around lives thanks to the innovative approach that's only possible due to the freedom afforded to them. You'd think that before writing off these schools and their operating model due to little more than narrow-minded and ideologically driven Labour Party policy, the Minister owes it to the students, their parents, and the teachers of these schools whose lives he's about to turn upside down, to have at least made an effort to meet or visit them as Minister. Especially when, as Hipkins recently announced, that the government is going to be undertaking a significant review of the education sector. Of course for Hipkins it's much easier to threaten Charter Schools with closure if you don't have to come face-to-face with the families whose lives you're going to throw into turmoil. Given how often the then Labour opposition demanded this of the previous National Government, it seems like they're firmly on track to be guilty of the same behaviour. You can read the full OIA I received from Hipkins below. Prime Minister Jacinda Ardern's claim that she wanted to bring kindness back to Government, made on 26 October 2017, seems a long time ago in light of Education Minister Chris Hipkins' decision that it's "our way or the highway" to Charter Schools this week. If you're one of the students, their parents, or a teacher at a Charter School, Hipkins' announcement on 8 February would have come as a bombshell. Having made previous commitments about the Ministry of Education conducting case-by-case negotiations in good faith with Charter Schools, and that such negotiations will be carried out by the Ministry rather than Ministers, this week Hipkins turned that all on its head. In a sinister sounding press release, Hipkins has essentially told Charter Schools that if they don't agree with the Ministry of Education by May 2018 to terminate their contracts early, then Hipkins himself will intervene and tear them up for them. Perhaps the Education Minister should visit one of those Charter Schools he's so eager to close, borrow a dictionary, and look up the meaning of the phrase "good faith". Because he'll find that telling people to agree to his his terms "or else" doesn't come under the definition. What's interesting is that the entire approach to Charter Schools by the new government flies contrary to Prime Minister Jacinda Ardern's promise that she would bring kindness back to Government. There is nothing kind about her Government's handling of Charter Schools, especially given that many of the students attending them have been failed by the state school system that Chris Hipkins is so ideologically bent on forcing them back into. Simply put, the Government's approach is callous, heartless, and Hipkins in particular has taken the tone of a schoolyard bully about it. The thing is, it didn't have to be this way. Labour could have simply announced it wasn't going to fund the opening of anymore Charter Schools, and allowed the existing ones to keep going. It wouldn't have been quite the win that the teachers' unions were demanding on the policy, but it likely would have been enough to keep them happy, and not derail the Government's post-Waitangi Day high. What's more, the whole announcement around forcing Charter Schools to close from Hipkins is indicative of an ongoing issue from Jacinda Ardern's Government (and one that plagued the Labour Party in opposition too), and that is their uncanny knack to do something good at the start of a news week, then spectacularly shoot themselves in the foot by the end of it, which you can read more about in 100 days of action looking like 100 days driven to distraction. Of course, a common theme in this all appears to be Chris Hipkins. Whether it was stuffing up Labour's leadership of the House, announcing policies which he hasn't costed yet, or not being able to remember whether fee free tertiary education would apply to Australian students studying in New Zealand, Chris Hipkins seems woefully out of his depth. It's also interesting that for all the apparent experience in the Prime Minister's Office, such as Heather Simpson, Mike Munro, and Mike Jaspers, that simple political mistakes and mismanagement seem to keep plaguing Labour. Either everyone's just not very good at their jobs (which in the case of Simpson, Munro, and Jaspers I don't believe, because they're all extremely good operators), or - the more likely option - people like Chris Hipkins are failing to communicate or coordinate with the PMO at all. The net result of Chris Hipkins' bully-boy tactics towards Charter Schools is that it's taken all the gloss off the Government's successful visit to Waitangi. Instead the narrative for the week ahead will be people asking what students in Charter Schools did to deserve to be so directly threatened by Chris Hipkins, and where did Jacinda Ardern's promise to be kind get lost over the summer?